A historic hut in the Tararua Range, three hours’ walk from the nearest road, has been trashed, baffling trampers and conservationists. “They left it a pig-sty really, we’re really upset,” said Tararua Tramping Club member Barry Durrant, who discovered the “scene of utter vandalism” when arriving at Cone Hut on the Tauherenikau River, west of Greytown, with fellow club member Grant Timlin on Friday. A 10-litre can of white acrylic paint, left over from a working bee, had been tipped on the floor, mattresses had been slashed and one dumped in the pool of paint. 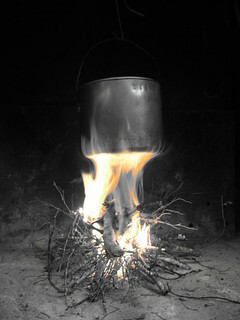 The hut was strewn with rubbish and the hut book, a vital safety tool, was missing and its case smashed and burnt. 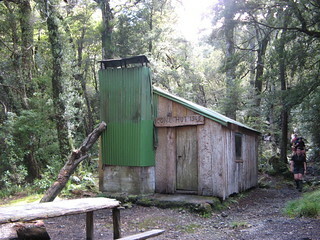 Cone Hut , with its unique character and its history, is one of the neatest back-country huts to visit in the Tararua Range. It’s well looked after, both by committed Tararua Tramping Club  members and by DOC, on behalf of the public and the hut’s users. This is the type of cost that nobody wants to have to pay for, but worse than that is that it’ll be a kick in the guts for many of those people who donated time, effort and expertise so that any others can enjoy and take advantage of the facility. I suppose there will always be an element of society who sees this as some kind of victimless crime, or simply doesn’t care. It’s not victimless. 6 Comments To "Cone Hut trashed by vandals"
How disgusting. And unfortunately It will probably be impossible to find out who did this. If they do ever identify the culprits they should be required to clean up the mess along with paying for replacement of the mattresses etc. Most of us are utterly baffled as to why some idiots do this sort to thing. Thanks Thea. And yeah, I think one of the things that saddens me most about this is that . Hopefully it doesn’t go so far. Kia ora Mike…I find the whole thing extremely sad really. Another sign of complete disconnect in our relationships with wilderness by huge segments of our society. I recall some years ago Rangiwahia hut was trashed and degraded as well. Have we reached a point where trail cameras have to be hidden along the tracks to any hut less than 3 hours from a roadend? I would write that should these culprits be caught they should have to front up to the TTC en masse. That would be true Restorative Justice. Thanks Robb. I think my only reluctance to express total outrage at this, as has come out in many other forums, is the sad knowledge that the behaviour is not as isolated as its media coverage would tend to suggest. Hopefully this is an isolated incident for Cone, though, at least. I see on the  that Cone hut is in the process of being cleaned up and upgraded. A new woodshed clad in totara slabs to match the hut has been erected, and the dirt floor in the hut is to covered over with a floor, while the sleeping platform is to be covered in plywood. While perhaps removing some of the “character”, the improvements will make staying at the hut more pleasant. Good work by the TTC and DOC to keep the hut.